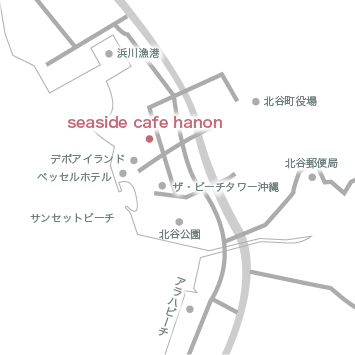 Cafe hanon — the inside of the American village in Mihama in Chatan — it is in the place from the sea most. If the blue door of a mark is opened, there is the space of only blue and white. It has spread that there are not the sea which carried out the many colors blue color, and a thing which empty interrupts in impending. It is wrapped in the white clouds and sea breeze of the white ship in the offing, and empty, and is cured by the sound of a wave. It should pass pleasantly in unusual special space, tasting a fresh baked pancake and freshly ground coffee. 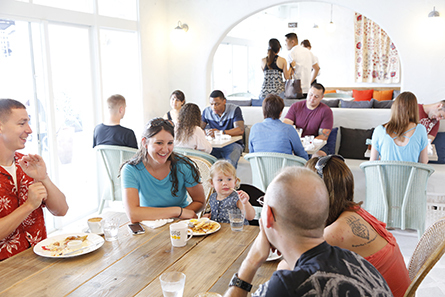 It is the small cafe built with such a thought. Pleasure is loaded with staff all the persons concerned and the heart, and I am waiting to meet you who open a blue door. There is a parking lot in about 40 minutes by car from Naha Airport. It is about 15 minutes in Okinawa south IC from Okinawa Expressway to a car. 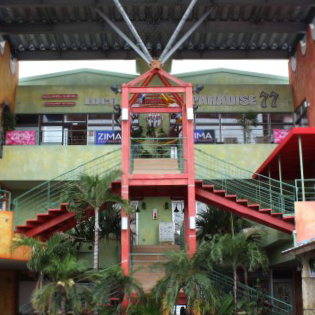 It is convenient if you input “Bessel Hotel Campana Okinawa” into car navigation. We would like to inform you about the following change in our business hours starting 1st April Last order pancakea 6:00pm drinks 6:30pm Close 7:00pm we apologize for any inconvinience and ask for your understanding Thanks. 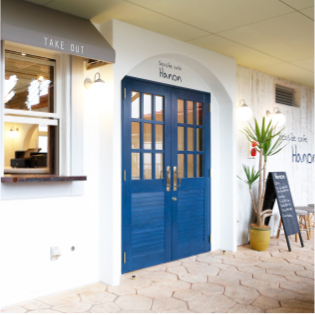 Seaside Cafe Hanon is allowed to carry out a rest on Monday every week.However, when Monday is a public holiday, it opens from 9:00 in the morning.And Hannon is allowed to make the next day into a substitute holiday. A terrace seat in which the sea looks well can be reserved.Please do not hesitate to tell the staff by telephone.